What Are Drug Addiction Assessments for? Treatment for a drug or alcohol problem usually begins with an addiction assessment.1 The purpose of the assessment is to determine whether an addiction is present, the extent of the addiction, whether there are co-occurring conditions, and to assist in the development of a treatment plan. Professionals trained to diagnose addictions typically conduct alcohol and drug abuse assessments in private settings. All information that is provided by you is kept confidential and only used to assist in your treatment. Different types of professionals are trained to assess people for addictions, including doctors, nurses, counselors, psychologists, therapists, and social workers. Typically, multiple people will evaluate you, especially if you are being cared for at an addiction treatment facility. This helps to ensure you receive the correct diagnosis for your condition and the best treatment possible. Assessments often include questionnaires, physical exams, and self-assessment. The addiction assessment process is fairly straightforward. The doctor or clinician will have you fill out a standardized questionnaire asking about your current drug or alcohol use, treatment history, health history, patterns of behavior, symptoms, and the effects the addiction has had on your life. Afterward, the clinician will conduct a face-to-face interview with you, asking standard, open-ended questions that provide information to make a proper diagnosis. Cutting down on drinking: Have you ever felt you should cut down? Annoyance because people criticized your drinking: Have you ever been annoyed when criticized for your drinking? Guilty feelings: Have you ever felt guilty about your drinking? Eye-openers: Have you ever felt the need to drink immediately in the morning? If a medical doctor conducts the assessment, there will likely be a physical examination. In addition to checking for the physical symptoms of addiction, the doctor may diagnose co-occurring health problems that need to be treated along with the addiction. Psychologists, counselors, social workers, and other non-medical persons who perform drug and alcohol abuse assessments may refer you to a doctor for a physical evaluation. Co-occurring medical problems will impact how the addiction is treated, so it is important to be examined by a doctor as early as possible in the addiction assessment process. A urine sample may be requested to test for the type of drugs you have consumed. Blood samples are usually not required but may be asked for if there is reason to believe the addiction has affected your health. For example, a blood test may be used to assess liver function in a person with an alcohol abuse problem. Although it is best to obtain an official diagnosis from a qualified professional, you can perform a self-assessment test to determine whether you have an addiction to drugs or alcohol. These addiction assessment tests can be found in a number of places across the internet or from local mental health centers. Do you feel you must consume drugs or alcohol to get through your day? Have you ever sought medical attention because of your drug and alcohol use? Has your performance at school, work, or home been affected by your drug and alcohol consumption? Do you constantly think about the next time you will drink alcohol or take drugs? Has your drinking or drug use interfered or caused problems with your personal relationships? Have you suffered from memory loss after using drugs or alcohol? Do you experience withdrawal symptoms after not consuming drugs or alcohol for an extended period of time? Do you go to extensive lengths to obtain drugs or alcohol? Do you remain intoxicated for several days at a time? Do you say or do things while intoxicated that you later regret while sober? Some tests require only “yes” or “no” answers, while other tests may use a rating system where you are asked to rate your experience on a sliding scale. Almost all tests will provide a score that supplies immediate feedback about your drug and alcohol use. The primary benefit of a self-assessment test is that it can be completed privately in a place where you feel comfortable, such as your home. The test can also provide immediate feedback regarding your drug and alcohol consumption. However, these tests should not be used as a substitute for a professional evaluation by a qualified doctor, clinician, or addiction assessment specialist. Drug screening tests use biological specimens, such as urine or hair samples, to test for the presence of drugs or metabolites. These tests cannot be used to determine if a person has a drug or alcohol addiction. However, they may be the catalyst a person needs to get help for his or her addiction. For example, a man who tests positive for illicit drugs and is fired from his workplace may see the negative effects drug use has had on his life and be motivated to seek treatment. Urine testing is the most common type of drug screening test, most likely because it is the easiest and fastest way to test for drugs. A person is generally sent to a third-party collection site to provide a urine sample. The sample is sent to a laboratory where it is analyzed for the presence of drugs or the metabolites produced after the body has processed the drugs. Urine testing kits can be purchased to conduct tests in a less formal environment. Typically, these kits test for drugs that are commonly abused, such as marijuana, cocaine, methamphetamines, and ecstasy.2 The home drug tests are similar to home pregnancy tests in that colored lines indicate a positive or negative answer. There are, of course, limits to urine drug tests. Most drugs are metabolized by the body and may not be detected after a certain period of time. Additionally, the urine specimen can be tampered with and falsified. Hair follicle analysis is a more reliable way to test for the presence of drugs. It is less invasive, and most drugs can still be detected as long as 90 days after use, and hair from any part of the body can be collected for analysis. The analyses of hair follicles can form a more complete picture of a person’s drug use over time. Blood, saliva, and sweat may also be tested for drug use.2 The detection period, though, is very short. Typically, these tests are used when urine or hair testing is not available or practical. For example, police officers conduct onsite saliva tests to determine the amount of alcohol a person has recently consumed. Drug screening tests cannot be used to determine if a person has a drug or alcohol addiction, however. They are typically used in the addiction assessment process to determine the type of drugs a person is using. It is best to talk to a doctor or clinician to determine whether you have an addiction. Alcohol and drug use may contribute to or arise in association with a physical or mental health disorder. According to the National Alliance on Mental Illness, approximately 20.2 million adults in the U.S. have some sort of substance use disorder. Of those 20.2 million, more than 50% of them have a co-occurring mental illness.5 Untreated medical or mental health problems can complicate the recovery trajectory—sometimes prompting a person to relapse into addictive behaviors. So diagnosing and treating a co-occurring disorder is as important as treating the drug or alcohol addiction. Diagnosis of disorders that occur alongside an addiction is typically done in the same manner as diagnosing the addiction. In addition to obtaining feedback from the person seeking treatment, the clinician may perform tests, obtain the patient’s medical history, observe the person’s symptoms, consult the DSM-5, and use clinical judgment to determine whether the person has a co-occurring disorder. Depression: Symptoms include fatigue, loss of energy, excessive sleeping or insomnia, inability to concentrate, depressed mood, loss of appetite or excessive appetite, and suicidal ideation. Anxiety: Symptoms include difficulty controlling worry, restlessness, difficulty concentrating, muscle tension, irritability, and sleep disturbances. Post-traumatic stress: Symptoms include mentally re-experiencing the trauma, hyper-arousal, dissociation, cognitive and behavioral avoidance, and emotional numbing. Psychosis: Symptoms include visual and auditory hallucinations, delusions, disorganized speech, and catatonic behavior. Liver disease: Signs of liver disease include jaundice, itching, easy bruising, edema, mental confusion, kidney failure, fatigue, vague abdominal pain, loss of appetite, and weakness. Kidney disease: Symptoms include lethargy, shortness of breath, weakness, edema, metabolic acidosis, high potassium levels, uremia, and anemia. Malnutrition: Symptoms include fatigue, dizziness, weight loss, irritability, bone or joint pain, bloated abdomen, edema, brittle nails, dry skin, hair loss, changes in skin and hair color, slow wound healing, loss of appetite, and sunken temples. It is important to provide as much information about your symptoms as possible so that the clinician can correctly diagnose your condition and develop a treatment plan that addresses your specific needs. It may be a good idea to record the symptoms you experience in a journal and to present that journal when you meet with the doctor, clinician, or addiction specialist. 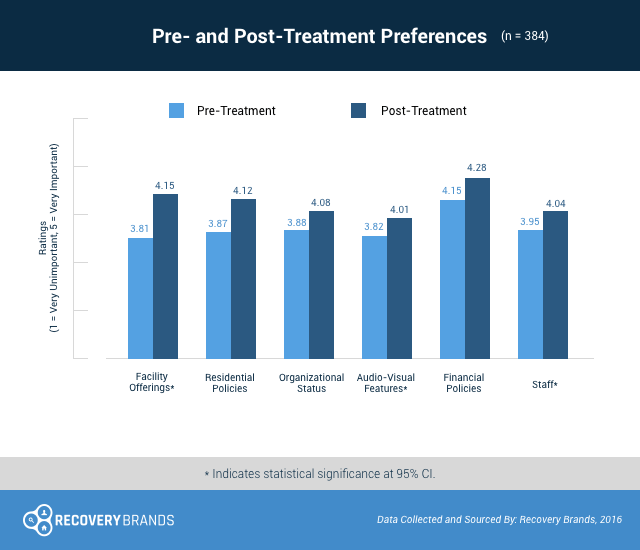 Recovery Brands collected data in 2016 asking people who were leaving an addiction rehab facility what clinic features they had come to view as vital things to take into account when considering a program. The highest-rated priority was the facility’s financial options, for example insurance accepted, payment options, and financial support. They also reported valuing clinic offerings (amenities, quality of food, recreation) significantly more after graduating from treatment. If you’re considering drug addiction treatment, you may want to examine a program’s payment policies as well as its offerings to aid in your final decision. To ensure you get the most tailored treatment for you and your situation, be sure to have as much information about your addiction and insurance or other payment options accessible as possible before contacting an admissions consultant or treatment center. Samet, S., Waxman, R., Hatzenbuehler, M. & Hasin, D.S. (2007). Assessing addiction: Concepts and instruments. Addiction Science and Clinical Practice, 4 (1), 19–31. National Institute on Drug Abuse. (2015). Chart of evidence-based screening tools for adults and adolescents. National Institute on Alcohol Abuse and Alcoholism. (2005). Screening for alcohol and other related problems. National Institute on Drug Abuse. (2016). Substance use disorders in adolescents: Screening and engagement in primary care settings. National Alliance on Mental Illness. (2016). Mental health by the numbers.